Silver shoes in all styles, shapes and materials are available here at The Wedding Boutique. From low metallic courts to glitzy platform sandals, you will find a comprehensive selection of silver shoes for many different occasions. Silver shoes are wonderful party and evening shoes, not to mention a fabulous choice for Prom Princesses. Because they are so versatile, they are fantastic bridesmaid shoes, giving your bridesmaids the option of wearing their stunning silver shoes for the evening do and future special occasions also. 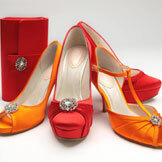 There is an extensive range of silver Prom, occasion shoes in our Sale section.